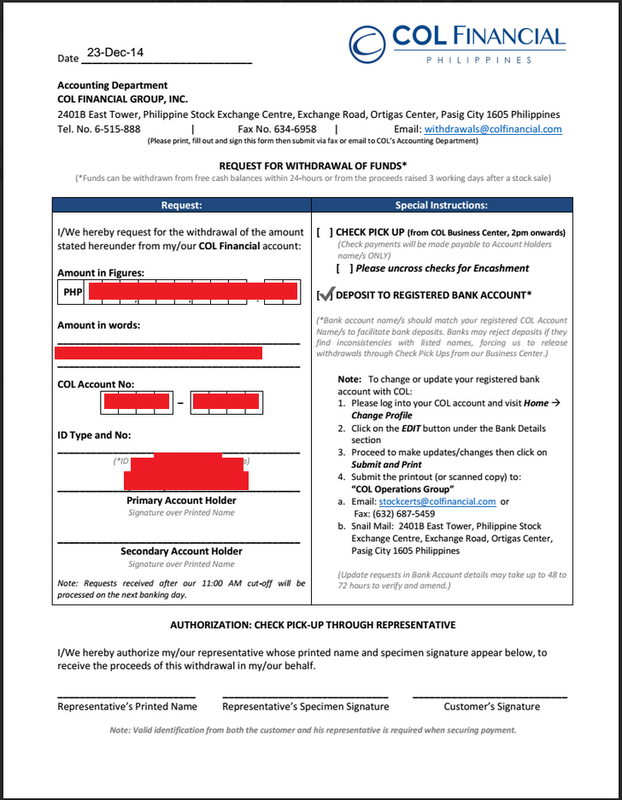 I've been getting a lot of emails/questions recently on how to easily withdraw funds in COL Financial through email so you do not have to personally go tho their office in Tektite Towers, Ortigas everytime you want to withdraw some of your funds in COL.
An individual can withdraw the proceeds of a stock transaction sale in three days (T+3) after a stock is sold subject to the procedures on the withdrawal of funds. An unused cash balance longer than three days dormant can be withdrawn anytime thereafter, allowing for one day notice with a cut-off time of 12 Noon to prepare the check payment for that day. 2. Download, fill-up and sign the Fund Withdrawal Form, indicate that you want the funds deposited to your registered bank account - this is the bank account you've nominated when you applied for your COL account. 3. Email withdrawals@colfinancial.com your request, make sure you've attached the signed Fund Withdrawal Form. COL will send a confirmation email and you just have to sit and wait for the funds to reflect in your savings account. Anyone else done this? Is there transaction fee for this transfer from Colfinancial to your BPI savings account? We've personally tried this on our own COL account. As far as we can remember there was no fee for transfer from COL to BPI. You can double check this with COL just to be sure. How many days until they could transfer the amount? If we remember correctly, it took 1-2 business days. i don't remember the bank account that i registered , how can i checked what account is it?. We're not sure in this case. It would be prudent to contact COL support for your question. You can check what bank you nominated for COL proceeds by logging in to your COL Account and click HOME then go to CHANGE PROFILE and click EDIT. In the Bank Details portion you will see the bank account you nominated, you can change that is you wish so. Hope this helps. Happy investing! Do I still need to sign the form? The one labled with Primary Account Holder, signature over printed name. If so, how do I sign it? I don't how to put my signature in a PDF file. In our case, we still signed the PDF document through Adobe Acrobat PDF tool. Our version allows us to type and draw the signature in the PDF document. We are not sure that all PDF readers have this option though. Can I just scan my form and e-mail it to COL? I don't have an Adobe Acrobat PDF tool, so I can't sign the PDF document I downloaded. I tried downloading the Adobe Acrobat from the Adobe website but it says I need to pay first before I can download it. Yes that should work. :) Scanning a document with an actual signature (your method) is actually better than an electronically created signature via the acrobat tool (our method). Just depends on what tools are available per person. What to write on the id type no.? What if I wanted to cancel my withdrawal request, how do I do that? incase of joint account, do we need both signatures or the primary account holder signature will do? Can i withdraw directly from COL financial office? Can i withdraw all of my funds? Yes you can assuming you were able to sell all your stocks. I know this kinda out of the thread, im planning to open an account in COL, but i dont have a bank account, how am i going to withdraw it? In this case, it seems your option is to drop by their office and withdraw your funds. Or if you have the time and extra funds, you can open a savings account with the major banks, I think they require around 2k or 3k for initial deposit.